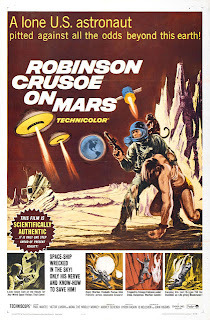 Essential plot rundown: After being rescued from the island, Crusoe invents space flight and lands on Mars. But not really. 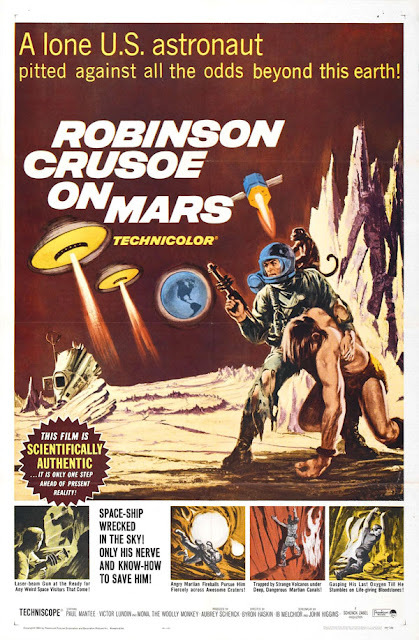 The title says it all: it is the story of Robinson Cruse set on Mars instead of an island. We watched this today in one of my film classes during our discussion of "elemental narrative." So, let's get some things straight first. Technology and science and information change, constantly. Today's audience watching this movie might scoff and it and its depiction of Mars. However, the filmmakers did research and they tried to create a world as close to how Mars was understood at the time. Or, at least, I understand they did. I wasn't there. However, this movie did not age well. The pacing is slow. Some parts aren't as intense as they should be. The "interplanetary vehicles" don't look real at all. He uses cassette tapes. And such and such. While it may have been good for the 60s, it does not hold up to today's standards. Therefore, I think Robinson Crusoe on Mars should be remade. With today's VFX and acting/story telling styles, I think it could be a really compelling story. But then again, I am a supporter of remakes. Overall, it is a decent movie. Interesting concept, but didn't age too well. I would recommend this to cinephiles and sci-fi aficionados. I'm not sure how the average movie goer would receive it, though.